"From the opening words of Mars Poetica, Wyn Cooper creates for us nothing less than a manual for memory. The word "reverie" punctuates these poems, and no wonder! For in this book, Cooper wanders and dreams whole continents, the pattern of a skirt, a song no longer playing, lost friends, former homes, spent years. What will we miss the most when we have left Earth? Everything Cooper gives us here and more." 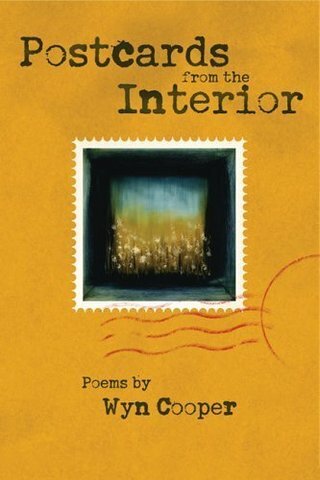 Postcards from the Interior is a collection of poems in free verse, formal verse, and prose poetry. The first section, “Postcards from Vermont,” is composed of poems from Vermont towns and historical landmarks, such as Robert Frost’s grave. The second section includes poems from other settings, real and imagined. "Postcards from the Interior mashes-up interior Vermont against the interior United States, physical landscapes against the landscapes of Hell, Dream, Desire, and Independence, as well as verse versus prose." This book is now in a third printing. It contains an introduction by the novelist Madison Smartt Bell, who went on to cowrite and perform a CD with Wyn, Forty Words for Fear. The CD contains a spoken word piece by producer Don Dixon, based on the title poem of this book.